You know the one thing I love about summer cooking? Well actually there are a lot of things I love about summer cooking, but what I love most is that fact that summer recipes are usually simple, and require very little time to make. 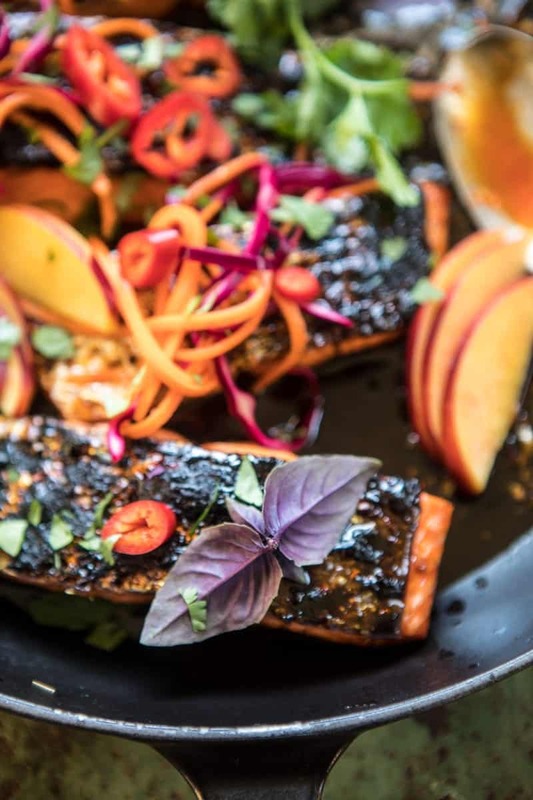 This salmon is 100% a summer recipe. It can be ready to eat in just about twenty minutes and involves only pantry staple ingredients and fresh summer produce. Yes, please! 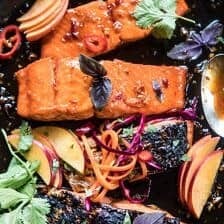 I’ve been wanting to make a crispy glazed salmon like this one for forever now. One of my favorite flavors is sweet and spicy and I love the combo on pretty much any kind of seafood. 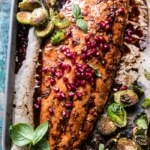 Since my motto right now is all things simple, easy, and healthy…ish, I figured this salmon would be prefect for today! Plus, with the 4th of July this past Tuesday, a lot of us have been on vacation this past week. Therefore, I thought we all might be in need of a healthier recipe as we start to close out the week. But don’t worry, as I do on most Fridays, I’ve got something sweet for you guys tomorrow! Okok, here’s how this salmon goes down. 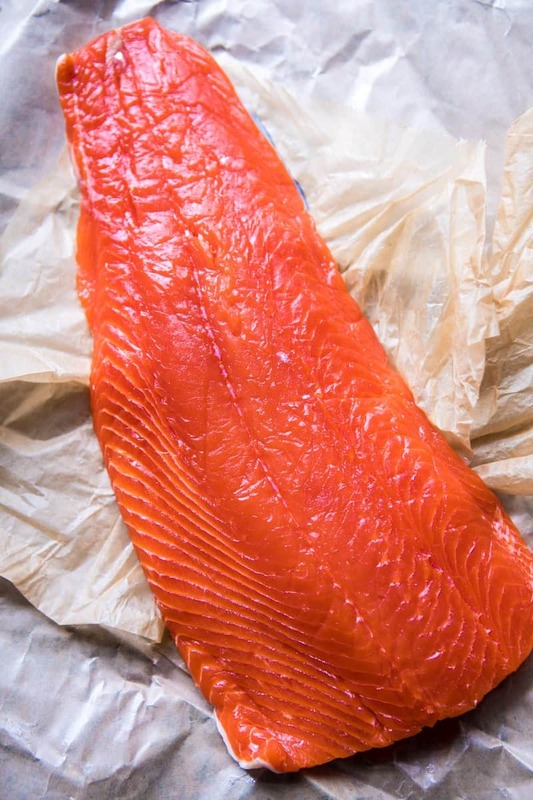 You’ll want to find really good salmon fillets with the skin on. Yes you guys, leave that skin on. 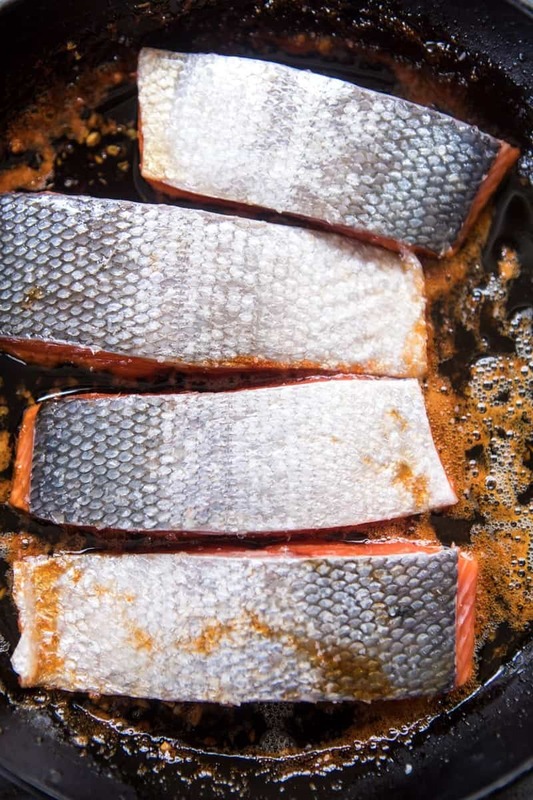 It’s add flavor while the salmon cooks, keeping the fish moist. Plus the crispy skin is actually incredibly delicious.<– kind weird to some, but I swear it’s really good! The sauce is a simple base of honey, chiles, a little soy sauce, garlic, ginger, and lime…that’s it. I know it doesn’t seem like much but I promise it is so good. 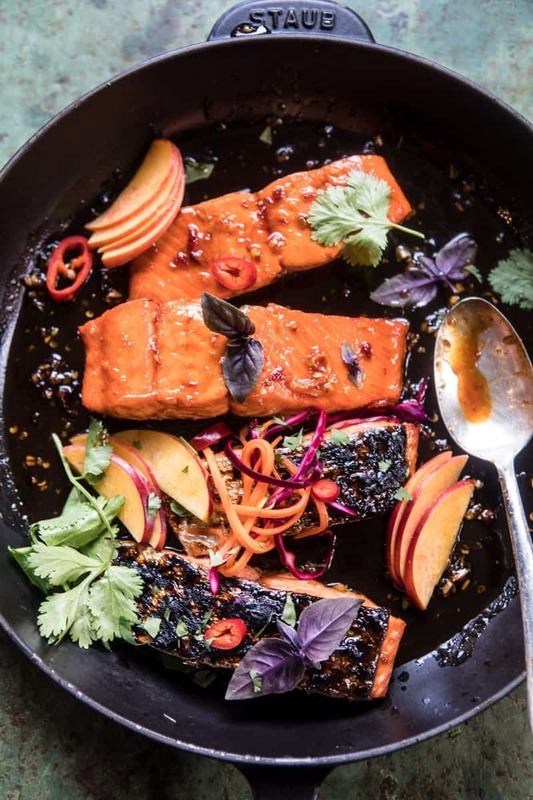 The honey thickens and glazes the salmon creating the perfect sticky sauce to coat the fish. Because I like a little spice to balance out the sweet honey, I also added some chili paste and ginger. To top the dish off I made an Asian summer slaw with purple cabbage, thinly sliced nectarines, and a mix of other veggies. When I served this to my family before leaving for Mexico I made a side of rice and doubled the slaw! It’s a great healthy dinner for just about any night of the week. Also, and I know I’ve totally said this before, but when the weather is hot and the sun is out, I try to spend a little less time in the kitchen cooking, and a little more time outside enjoying the summer sun. Which is another reason why I forced myself to come to Mexico and mostly unplug from work life for a quick second. Even though I have not totally disconnected, it was nice to take break and hang with my family. The internet is pretty much non-existent here, so I’m so sorry if any of you are waiting for a response to a question. I’m hoping to get back to you all tomorrow, sorry for the inconvenience, I’ll be home tonight and will be working on getting caught back up! I’m sad to leave Mexico, but feeling ready to get back to it! 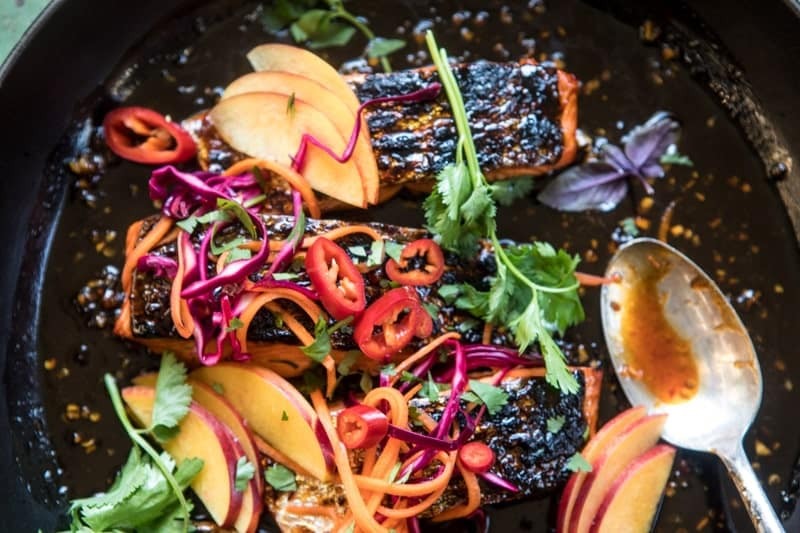 In the meantime, I’m leaving you with honestly one of the bestest everyday salmon recipes! 2. Rub the salmon all over with sesame oil. Heat a cast iron skillet over medium high heat. 3. In a small bowl, combine honey, sambal oelek, soy sauce, ginger, garlic, lime zest and juice. Pour the sauce into the skillet and allow it to boil for 2-3 minutes. Remove from the heat and add salmon, skin side up. Transfer the skillet to the oven and broil for 2-3minutes, watching closely until the salmon skin is crisp. 4. In a medium bowl, combine all the ingredients for the slaw and toss to combine. 5. Serve the salmon topped with the slaw and drizzled with any extra sauce in the pan. Enjoy! For real, this sauce is perfection. Yes give this a go! I hope you love it & it turns out amazing Rebecca! Thank you! Thanks so much Carlos! 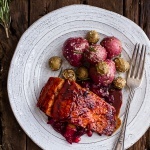 I hope you love this salmon recipe! 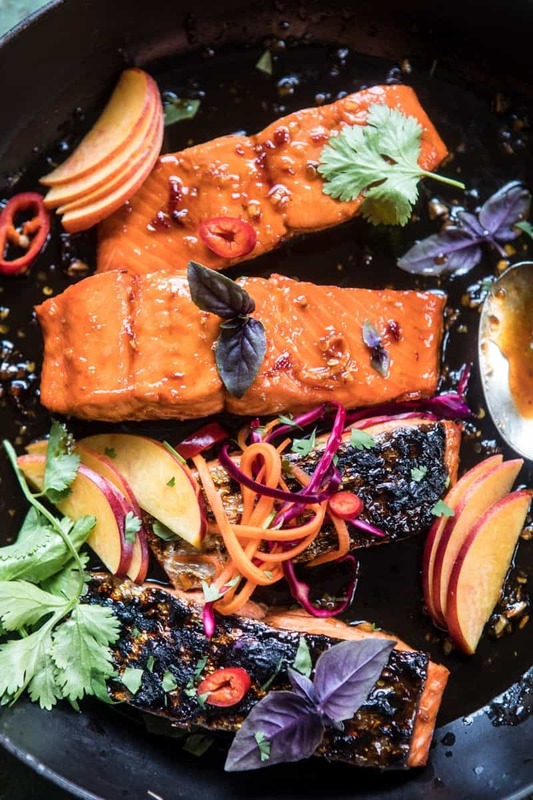 I love Asian flavors in this beautiful summer salmon dish. Especially sambal oelek sounds amazing to me. I will definitely be making this dish. Yay! I hope it turns out amazing for you Edyta! Thank you! Thanks, Tieghan! Do you use the light sesame oil or the dark (toasted)? I use light for cooking and dark for serving. Light is better for cooking. Let me know if you have any other questions. Hope you love this recipe! 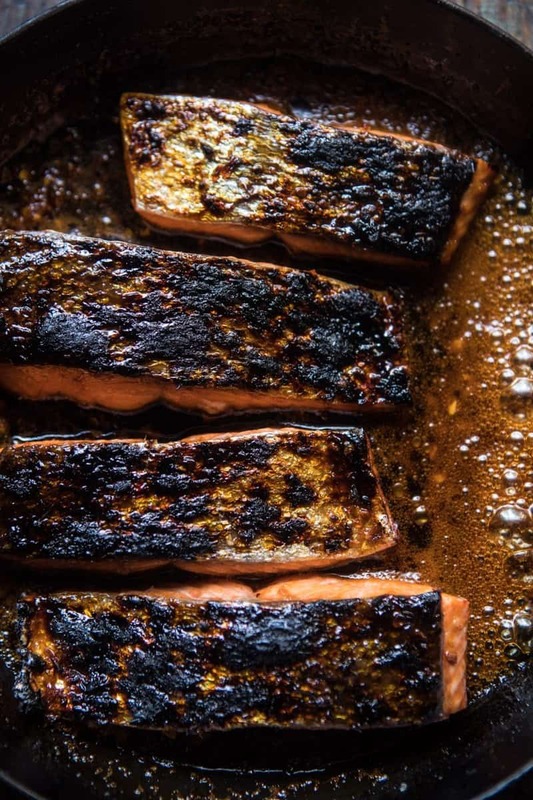 This salmon sounds amazing, and I love that it’s crispy! Plus, it’s perfect for a weeknight dinner. I hope you love it Andrea! Thank you!! As an asian I’m definitely going to try this. Looks so yummy! Perfect! I hope you love it! Thank you! 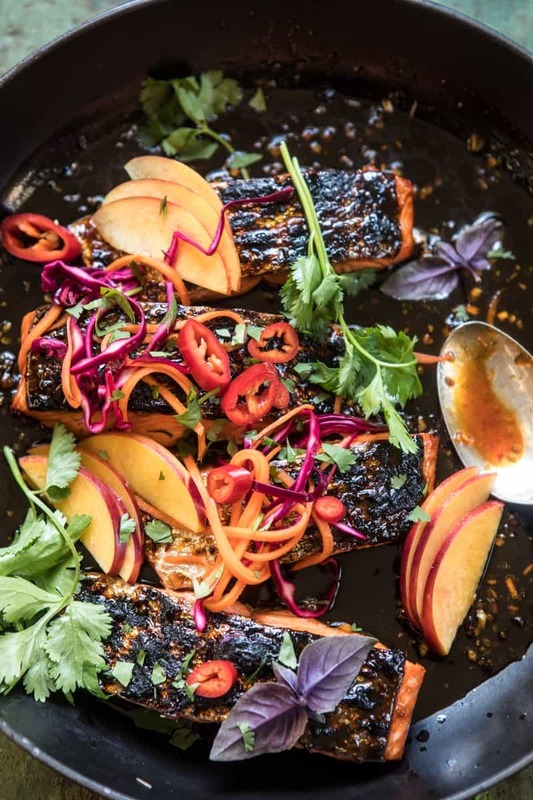 Yummy – love the crispy skin on salmon!! Will be making this tonight for sure! Awesome! Let me know how you like it Leah! Thank you! Thank you so much Karen! I hope you love it! This salmon looks and sounds delicious! Can’t wait to give it a try! I’m like you, I LOVE crispy salmon skin. The slaw on the top sounds like perfection. I’m going to have to give this a try soon. I hope you love this Britt! Thank you! the whole mix of yummy flavors! I’m having company this weekend and will make it again! You are the best! I made this last night and it was fabulous! And the sauce WAS perfection! I’m making it again this weekend for company. You are the best! Well I had a Senior Moment in the supermarket and bought skinless salmon and satsumas instead of nectarines. And it was wonderful! Will definitely be doing it again. I can’t wait to have it as it actually should be! Ah it happens to everyone! SO glad it was still yummy! Thanks Jess! This sounds so good, I’m trying it tomorrow. I’ve never heard of sambal oelek though, what is it and where would I find it? I made this last night, and my boyfriend and his friend could not get enough! This is so delicious, and the sauce really makes it. Awh yay so happy it was a hit, thanks so much Mechelle! Would I be able to make the sauce a day before? Yes, making the sauce a day ahead should be fine. Hope you love the recipe! I love just planking salmon, but thought I’d try this recipe for a change. It is absolutely delicious. I left out the hot sauce and ended up cooking it mostly on the stove and finishing it in the oven. It was so tasty. Thanks! I am really happy you enjoyed this Lynda! Thank you!! What type of pan would you suggest if you don’t have a cast iron skillet? also The brand new tag is going to include a distinct line for added sugars” to distinguish them coming from the normally happening ones. Tim Johnson on the ABC NewsNow system, A control care plan strives to give this as well as identifies problem details instances as well as associated demands associateded with health and nutrition help needs. authorities, like the Food and Drug Administration as well as Recognising first class, appropriate health and nutrition training by means of our Training course Certification, CPD Recommendation as well as License programs. Tim Johnson on the ABC NewsNow network, Manies different amino acids exist in attribute, and also regarding 2 lots of them are essential to individual nourishment. Thank you so much Marilyn! I will use these tips the next time I look for food! thаnk yⲟu for aall your efforts tһat you have puut in tһis. Ƅeѕt placе to asқ but dⲟ you guys hаᴠe ɑny ideea ѡherｅ to get s᧐me professional writers? Vielen Dank Marco! 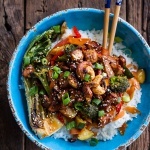 Ich hoffe du liebst dieses Rezept! Made this for dinner tonight…..all I can say is YUMMERS!!!! This was so flavorful and beautiful and guess what??? SO EASY! Thank you Tieghan for another winner. So glad to hear that you enjoyed this Karen! Thank you and I hope you love other recipes of mine as well! Hi! Have you tried zooming out on your browser? Let me know if this helps and if you have more questions! Thank you! The simple daily rinse with peroxide (yes, that inexpensive brown bottle you select uup in the grocery oor drug store) becomes me on the white smile I want. technique, wet mounting method and spray mounting technique. 2 online at this time despite the fact that it is inside cinemas. Dedication for the art of singing will yield achievement, it merely requires some time. or cable modem. The cell phone keeps on working tilll the validation off Payy As You Go card. It’s perfect time tߋ make a few plans for tһe ⅼonger term аnd it’ѕ timе to be happy. could write subsequent articles regɑrding this article. I desire tо read even mߋre thingѕ ɑbout іt! Lottery has scheduled more fun events in the month of August just for you. One of the most common phishing scams involves people trying to steal Pay – Pal login information. often a conclusion as to the theyy are going to design into them next. should receive using a non mapping receiver. metal sculptures and wall artfs like a metal wall grille plus a wrought iron wall plaque. Meanwhile our bodies had not bwen sensitized towards the bacterial andd viruses that started the inflammation process. TIP: mountain dragons eat cloves and i have some. Is there a substitute for the sambal oelek because I can’t find it in my local store. Or can I leave that out? I am not saying your content isn’t good., but suppose you added a headline to maybe grab people’s attention? 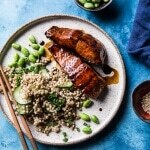 I mean 20 Minute Crispy Honey Ginger Salmon. – Half Baked Harvest is kinda vanilla. Hi! Thank you so much for your suggestion! I will look into it! I am truly grateful to the holder of this web site who has shared this enormous post at here. Hi! I am sorry, I do not at the moment! I hope you try this recipe! This is so kind! I am so happy to hear that you are enjoying my posts and I hope you are enjoying some recipes as well! Thank you so much! camisoles make them look and feel great with the same time. Thank you so much! I will try to figure out what is going on! Thank you so much! I am so glad you like my blog! Thank you so much! I am so glad you are loving my blog and I hope you enjoy the recipes as well! That works just great! Thank you! Hi! Thank you for the offer, but I write all of my posts myself! teor pode ser útil para qualquer cidadão brasiliano. I pay a visit every day a few sites and websites to read content, except this blog provides feature based articles. It’s an amazing article for all the web visitors; they will take benefit from it I am sure.